272 pages | 59 B/W Illus. Environmental translation studies has gained momentum in recent years as a new area of research underscored by the need to communicate environmental concerns and studies across cultures. The dissemination of translated materials on environmental protection and sustainable development has played an instrumental role in transforming local culture and societies. 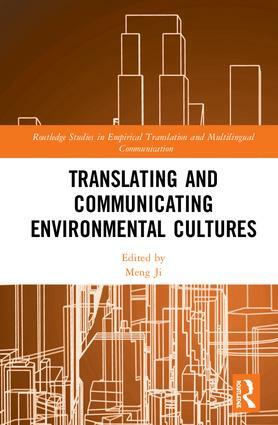 This edited book represents an important effort to advance environmental studies by introducing the latest research on environmental translation and cross-cultural communication. Part one of the book presents the newest research on multilingual environmental resource development based at leading research institutes in Europe, Latin America, North America and the Asia-Pacific. Part two of the book offers original, thought-provoking linguistic, textual and cultural analyses of environmental issues in genres as diverse as literature, nature-based tourism promotion, environmental marketing, environmental documentary and children’s reading. Chapters in this book represent original research authored by established and mid-career academics in translation studies, computer science, linguistics and environmental studies around the world. The collection provides engaging reading and references on environmental translation and communication to a wide audience across academia. Meng Ji is Associate Professor of Translation Studies at the School of Languages and Cultures, The University of Sydney, Australia. Empirical translation and multilingual communication represent highly interdisciplinary research areas. This series welcomes original translation and multilingual studies which use language corpora or digital language resources to advance our understanding of the nature and social function of translation and multilingual communication as an essential part of our globalised world. Empirical language studies in this series cover research topics from literary to specialised and domain-specific translations to bring insights into translation as a process and phenomenon which operates at cross-lingual, inter-cultural or trans-disciplinary levels. This series prioritises submissions which are theoretically informed and methodologically innovative through for example, the interaction of translation studies with cognate research fields such as media studies, comparative area studies, science and technology, health, international politics, public health, international business, etc.